Review date: 19 July 2001. When I reviewed Samsung's 17 inch SyncMaster 753DF last year (review here), I was impressed. The 753DF isn't the world's best monitor. It isn't even the world's best 17 inch monitor. But it has a good looking, genuinely flat screen, and a very attractive price. And here's its big brother. The SyncMaster 955DF has the same "DynaFlat" screen as the 753. There's just more of it. Samsung make the usual best-product-ever-created-by-sapient-life marketing noises about their DynaFlat monitors, but they actually are quite nice for the money. The DynaFlat screen has an excellent anti-reflective coating, it's genuinely flat, and it looks flat too (see the 753 review if you're wondering what this means). When I first wrote this review the 955DF sold for $AU896.50, delivered, from Aus PC Market, but they're not selling this product any more. US buyers can get a 955DF from the cheapie dealers for less than $US350 - less than $US300, from the really suspiciously cheap brigade. But that's not including shipping, which can be thrillingly expensive. For your money, you get an 18 inch viewable diagonal, and unremarkable 19-inch-screen dimensions. The 955DF's 47cm wide by 48cm high by 46cm deep (18.4 by 19 by 18.3 inches). This means it doesn't qualify as a "short tube" monitor like the SyncMaster 900SL (reviewed here) that I'm using as I write this. The 900SL is only 407mm deep, which makes it considerably easier to fit onto a desk with limited space behind it. Tube depth doesn't matter a lot to many users, though, and the 900SL now seems to be, de facto, a superseded product. It doesn't have a flat screen, and it cost about the same as the 955DF, and nobody much seems to stock it any more. If you spend a lot of time lugging your monitor around and neither of your parents hurls thunderbolts for a living, then no big CRT screen is going to be kind to your back. The 955DF weighs 23.5kg (51.8 pounds), which makes it lighter than most flat-screen 19 inchers. But it's still not what you'd call carry-on luggage. The 955DF has perfectly acceptable refresh rate and resolution specs. It can handle refresh rates up to 85Hz (non-interlaced, naturally) for resolutions up to and including 1024 by 768, and it can still manage 80Hz in 1280 by 1024. At higher resolutions than that, the monitor's limited pixel frequency bandwidth means the maximum refresh rate falls, and in 1600 by 1200 it can only manage a rather flickery 68Hz - and will probably only be driven at 65Hz by most PCs. So if you're dreaming of pixels the size of bacteria, then the 955DF isn't the monitor for you. But, frankly, neither is any other 19 incher, no matter how high a refresh rate it can manage. The reason for this is simple enough, and I've talked about it before in my other monitor reviews. Having electronics in a monitor that allow it to accept a 3200 by 2400 signal at 150Hz is all very well, but if the monitor doesn't have a tube that can actually clearly display that resolution, then you might as well not bother. You can figure out the real resolution capability of a monitor by looking at its dot pitch and arrangement. You have to know the real dot pitch, though, which is something that the four-colour glossies are unlikely to tell you. According to the Samsung marketing people, the 753DF and 955DF both have a 0.2mm horizontal dot pitch. In other words, there's one fifth of a millimetre, horizontally, between dots of the same colour in the three-colour gridwork that makes up the screen. This picture's of the 753DF screen, but the 955 looks the same in super-close-up. As you can see, the dot arrangement in this monitor (and in all other CRTs using the shadow mask design) means that a dot of a given colour doesn't actually have any nearest-neighbour dots of the same colour that are directly to either side of it, or above or below it. As I explain in the 753DF review, a 0.20mm horizontal dot pitch in a normal shadow mask monitor like this works out as a 0.231mm genuine dot pitch. The real dot pitch for hexagonally arranged dots is the diagonal distance from any dot to one of its same-colour nearest neighbours. 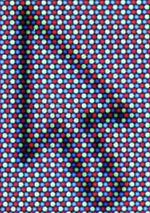 The smallest possible colour-rendering unit on a shadow mask CRT isn't a dot, though; the dots can only render one primary colour each. If you want to display any colour, you need a "dot triad" - a group of a red, a green and a blue dot. The hexagonal arrangement gives two triads per three dots horizontally, and one triad per two dots vertically. Those suffering geometry fatigue should stay with me. It'll all be over very soon. In a plain hexagonal dot arrangement, the horizontal triad spacing equals the horizontal dot pitch, and the vertical triad spacing equals 1.25 times the horizontal dot pitch. So, with a 0.2mm horizontal dot pitch, an 18 inch diagonal 4:3 aspect ratio screen like the one in the 955DF has about 1829 by 1097 dot triads on it. That doesn't mean it can resolve 1829 by 1097 pixels, though. Rectangular pixels map poorly onto the hexagonal dot grid. 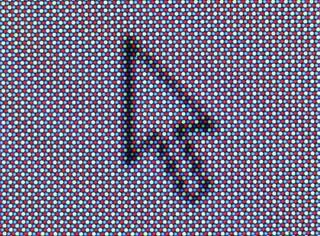 A general rule of thumb for telling how many pixels you can display, acceptably clearly, on a screen with a given number of dot triads, is to take the number of dot triads and divide by 1.25. That gives us 1461 by 878, for this screen. This is just a fudge factor, and shouldn't be taken as an ironclad rule; it's fine for your resolutions to be a bit higher or lower in either direction. So 1280 by 960 should look great on the 955DF. And it does. Perfectly acceptably sharp, if you ask me. But anything higher should look, well, not awful, but not as clear as it might. And that's the case. 1600 by 1200 on the 955DF looks noticeably fuzzy. You can't see individual pixels, even with a magnifying glass, because there just aren't enough dot triads to render them - and they bleed together horizontally more than they bleed together vertically, as you'd expect from the triad counts. Many cheap 19 inch monitors have 0.26 or 0.28mm dot pitches, though. If you buy a cheaper screen than the 955DF, you're practically guaranteed a higher dot pitch. So the Samsung does a better job on higher resolutions than a lot of its competition, if you ignore the refresh rate. The 955DF keeps its control buttons on this slide-out "tongue", which extends at a measured pace when you push on it once, and clicks closed when you push on it again. It's a fun feature, but I can't help but think that it might have something to do with the chunkiness of the 955DF's screen surround. This isn't actually a big fat monitor for its screen size, and it doesn't actually have a smaller-than-usual viewable area for a 19 incher. But the surround is a bit wider than usual all around and particularly wide at the bottom, which gives the impression of a smaller screen. Aesthetic quibbles aside, the 955DF's pop-out buttons give you access to the usual plethora of settings, with the usual on-screen display. Cheaper monitors used to deny you even relatively basic geometry controls like trapezoid and rotation (useful for compensating for nearby speaker magnets), but that's not the norm any more. The 955DF, like every decent screen these days, has the works. Pin balance, vertical linearity, hue, saturation, moiré, separate horizontal and vertical focus, colour temperature adjustment in 44 steps from 5000 to 9300 Kelvin, et cetera. And the ability to tell the on-screen display to use any of nine languages, so when you get bored you can set your workmate's monitor to speak Korean. What this means is that graphic designers on a budget will not hate this monitor. They might, however, prefer one with slightly better stability when the screen contents change. As with other non-professional monitors, the 955DF's display geometry changes noticeably when there are large changes in the screen contents, as when you flick from a mostly-white word processor to a mostly-black CAD package. But the changes are not large enough to bother the majority of users, including me. Similarly, it's likely that you won't be able to perfectly dial in the 955DF's geometry settings. If you peering closely at your screen, noting the distances of each corner of the lit display from the plastic surround, there'll probably be noticeable differences. My 900SL's the same, and so is every other "budget" monitor I've ever seen. Some people get very hot and bothered about this sort of thing; I'm not sure why, personally. We are talking about geometry differences that often amount to just a few minutes of arc when measured at their most extreme points, here. Yes, you can see it. But, normally, only if you're looking for it. If you ask me, for the money, you really can't complain. A more valid gripe has to do with budget screens' colour rendering, which can be well sub-par by professional standards. If it's important to you that your cross-device colour calibration be absolutely bang on, and that the whole screen render every colour precisely uniformly, then no budget screen is likely to be good enough for you. Which includes the 955DF. I do quite a lot of imaging work myself, though, and I've got no problem whatsoever with doing it on a screen with mildly questionable colour rendering. Just looking at them, with a variety of different graphics, the DF screens all look better than fine for the vast majority of PC tasks. And that definitely includes the games that many people buy a big monitor to enhance. Another thing that might irk people looking for a pro monitor on the cheap is the 955DF's built-in video cable, and lack of any other input connectors. Many better screens have at least two inputs, with an unpluggable 15 pin cable for one input and a set of three BNC connectors for the other. The BNC connectors allow serious graphics folks to connect very high quality video leads, which can significantly improve screen clarity at high resolutions. They also let underinformed poseurs connect cheap BNC leads and wonder why their display now looks worse. In reality, for the resolutions the 955DF is meant to handle, it doesn't matter whether you use a pack-in video lead or a fancy after-market one, assuming you don't need a long cable run. The built in cable gives results as good as any other could, in and around 1280 by 960, which is this monitor's best resolution. And since most people only want to connect their monitor to one computer, another connector would just push up the price and provide a habitat for dust mites. For value for money, the sweet spot is still 17 inch CRTs, not 19s. When this review was first written the SyncMaster 753DF sold here for $AU533.50, delivered within Australia, from Aus PC Market (who are no longer selling it). For comparison, you'll pay $AU775.50 delivered for a 17 inch Sony Multiscan E220, and the other big-brand Cathode Ray Tube (CRT) screens that come in cheaper than the SyncMasters generally turn out to have considerably lousier specifications. Curvier, larger dot pitch screens, lousier anti-reflective coatings, less impressive resolutions and refresh rate stats. So the 17 inch DynaFlat remains a very good deal, but the 955DF isn't vastly worse value. 21 inch monitors are very expensive (and very heavy) for their size, but 19 inchers aren't stupidly pricey, and give a worthwhile screen area gain, if you ask me. Here's how the numbers work out. Generally speaking, modern monitors have a viewable area diagonal about one inch smaller than their actual "size" number. So a "17 inch" screen has a 16 inch diagonal, and a roughly 123 square inch viewable area. A "19 inch" screen will have about a 156 square inch viewable area, while a "21 inch" will manage about 192 square inches. When you pay about 70% more to get a 19 instead of a 17, you get a bit more than 25% more screen area. But when you pay another 70-odd per cent more to get a 21 instead of a 19, you get a bit less than 25% more screen area. A 21 is likely to cost almost three times as much as a 17 with similar tube quality, but give you only a bit more than one and a half times the screen area. So if you want a big screen but you're not made of money, you want a 19 incher. And the 955DF is worth checking out. Some people need a really super-precise monitor, and thus shouldn't buy any "consumer" screen, including any of the DynaFlat models. Some other people don't need a professional grade display for anything in particular, but are just deeply irked by the slight geometry, focus or colour rendering quirks that consumer monitors all have. These people won't like the DF screens, either. Some people have an amazing tolerance for even the most horrid monitor defects, and will keep on trucking with a screen that's had a giant magnet put next to it and is now half green and half purple, or has a massive geometry anomaly caused by a component failure, or just has sufficient crud all over it to be amenable to archaeological exploration. These people, when their current monitor finally dies of shame, should buy the cheapest new screen they can get. Or hit an auction and get something, anything, for five bucks. Why not? If you're not doing pro graphics work, though - or even if you are, but on a tight budget - and you don't mind minor display oddities, and you do have the ability to tell the difference between a screen that's emitting smoke and one that isn't, then the DynaFlat range is well worth considering. If I didn't have a 900SL already, I'd use a 955DF. Recommended. Aus PC Market don't sell these products any more (click here to see the monitors they're currently selling), but you can still try a price search at DealTime! Samsung SyncMaster 753DF - Super image quality, and excellent value for money, too! 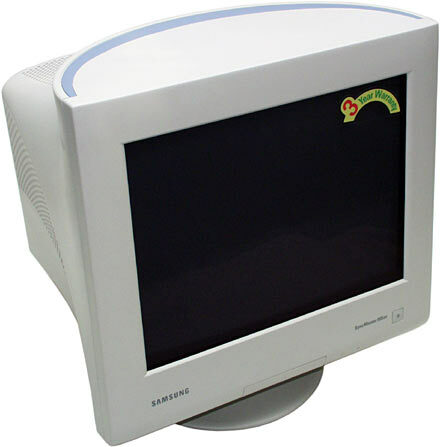 Samsung SyncMaster 900P and 900SL - 19 inch screens; high quality, low price. Acer FP350 LCD screen - A cheap(er) LCD monitor. So what's the catch?